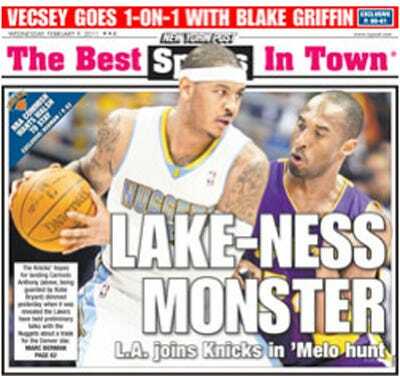 The NBA world was abuzz yesterday with rumours of an Andrew Bynum for Carmelo Anthony trade, and even though the rumour was quickly debunked and the Lakers made it clear they’re not trading Bynum, Knicks fans quickly panicked.The front page of today’s New York Post ignores all the evidence against a possible Lakers/Nuggets trade, and in effect, did exactly what the Nuggets were hoping when they (likely) leaked the Bynum rumour. Even though the reality was that a Bynum/Melo trade was completely ridiculous, the Nuggets were attempting to gain leverage over the Knicks, and they did just that. Knicks fans were petrified at the idea of losing Melo again, and you can bet the Knicks’ front office is feeling more pressure today than they were just 24 hours ago.